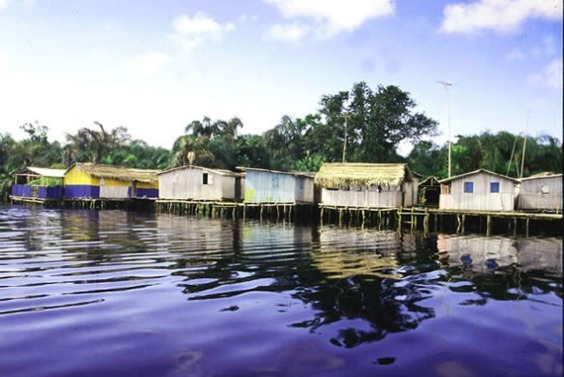 The population of Nzulezu is roughly 500 men, women and children, governed by a village chief and a handful of village elders. Although the town is very small, with only one “main street,” there are two churches (Pentecostal and Catholic) that stand side by side. There is one school, grades K-6 and if the children plan to go further in their education they must enroll at the public school in Beyin and commute via canoe everyday. The “school yard” consists of four logs, two per side on the “field”, making up football goals as they stick out of the shallow areas of the lake. Although they live on water, their main source of income is agriculture. They own some land 1 km north of the lake where they grow a variety of vegetables and fruit which they sell in Beyin and the surrounding areas. There is also little exposure to the outside world with no television and poor radio reception. This place is one of the finest place i have ever been in Ghana. Even though I've been in Ghana two times (six months in total) and I visited a lot of places, I never had the chance to go to Nzulezu. Next time I go back (July 2014) I'm going to try to go there because I heard from other volunteers it's an amazing place!! Wow! What a village! I wasn't expecting what I experienced in Nzulezu! It really is an entire village on stilts! The people there are like every Ghanaian you meet, extremely friendly and hospitable! They didn't mind pictures as well! Coming from America, it was incredible to see how one lives without current technology. It was so refreshing! I admired the villagers! You must see this village when you're in Ghana. I thought it was really interesting to see since I had never seen something like this before. You can see their whole village and way of life, as well as the school where the children go. The journey to the village is also an experience. You go by canoe, but there is a chance that you get a bit wet during the boat trip. The people who show you around are really nice and from the village itself. Also, there is a restaurant just before you go in the boats and getting a taxi is not that difficult.